SHAH ALAM: The smart phone application named MyDistress, which was introduced by the Selangor police in August 2011, could speed up police response to the crime scene by enabling them to arrive within eight minutes. Selangor police chief Datuk Tun Hisan Tun Hamzah said the effectiveness of the application was proven when the police managed to arrive at the scene of the reported crime on two separate occasions and rescue the victims along with apprehending the perpetrators while successfully recovering the properties. In the first incident, a woman activated the emergency calling system on her smart phone when four men armed with machetes attempted to rob her in Sungai Way, Petaling Jaya after midnight on Sept 16 last year. Tun Hisan said the police came to the rescue of the women within five minutes and arrested the four men. The second incident occurred a month later when a man used the application to alert the police when he saw four men also armed with machetes break into his neighbour’s home. The police reached the scene in six minutes and successfully arrested the trespassers, Tun Hisan said. He said the system is so effective that the police could detect the victim who activated the distress call within two metres away. 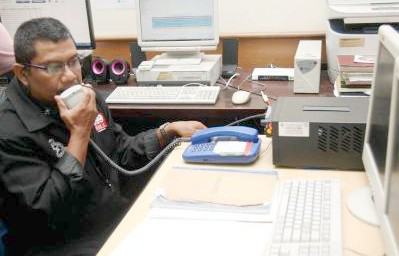 The MyDistress application was introduced by the Selangor police in August last year. He added that the system was an initiative by the police in an effort to increase the participation from the public to prevent crime in line with the Government Transformation Programme’s (GTP) Crime National Key Results Area (NKRA). The MyDistress application is a pilot project and currently only useable in Selangor. It can be downloaded from https://mydistress.net and is available on the Blackberry, iOS, Android and Java phones. To date, 70,108 users in Selangor have registered for the system.